Figure A. Alexa Fluor 647 conjugated Mouse anti Human CD45 (MCA87A647) and FITC conjugated Mouse IgG1 isotype control (MCA928F). Figure B. Alexa Fluor 647 conjugated Mouse anti Human CD45 (MCA87A647) and FITC conjugated Mouse anti Human CD95 (MCA1539F). All experiments performed on human blood gated on monocytes in the presence of 10% human serum. Data acquired on the ZE5™ Cell Analyzer. Figure A. Alexa Fluor647 conjugated Mouse anti Human CD45 (MCA87A647) and FITC conjugated Mouse IgG1 isotype control (MCA928F). Figure B. Alexa Fluor647 conjugated Mouse anti Human CD45 (MCA87A647) and FITC conjugated Mouse anti Human CD95 (MCA1539F). All experiments performed on human blood gated on lymphocytes in the presence of 10% human serum. Data acquired on the ZE5™ Cell Analyzer. 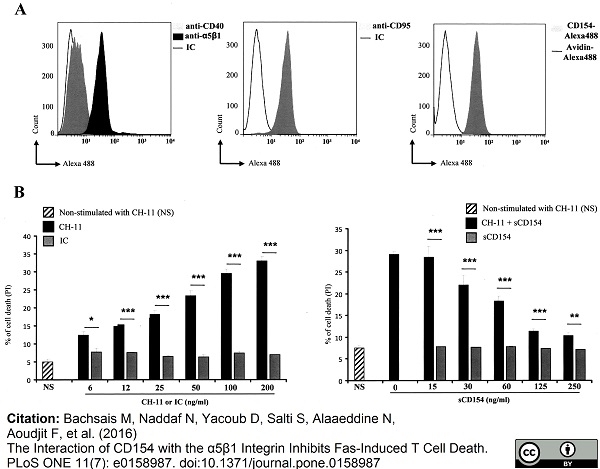 Soluble CD154 inhibits Fas-mediated cell death in HUT78 T cells. 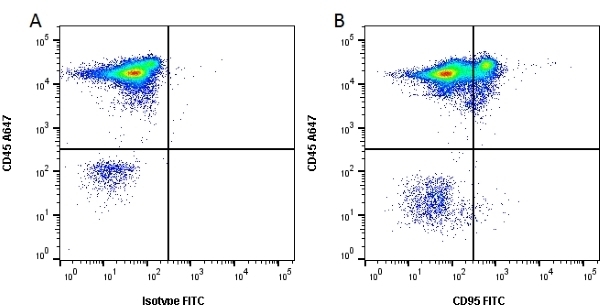 (A, Left and middle panels) HUT78 cells were incubated with anti-α5β1 JBS5 mAb, anti-CD40 G28.5 mAb, anti-Fas LOB3/17 mAb, or IgG isotype control (IC) followed by mouse anti-human Ig labeled with Alexa 488. (A, Right panel) Cells were incubated with Avidin-Alexa 488 (negative control) or sCD154-Alexa 488 (20ng/sample). 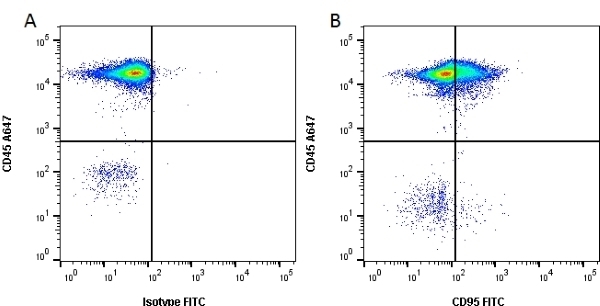 (B, Left panel) HUT78 T cells were left non-stimulated (NS) or stimulated with different concentrations of anti-Fas CH-11 mAb or IgM isotype control (IC) for 48 hours at 37°C and assessed for their cell death response by FACS analysis as the percentage of death obtained by propidium iodide staining. (B, Right panel) HUT78 cells were pre-treated with different concentrations of sCD154, then left non-stimulated (NS) or stimulated with the anti-Fas CH-11 mAb (200ng/ml) for 48 h at 37°C. Cell death was then evaluated as above (± SD, * p <0.05, ** p <0.01, *** p <0.001 CH-11 versus IC). Mouse anti Human CD95 antibody, clone LOB 3/17 recognizes the human CD95 cell surface antigen, also known as Tumor necrosis factor receptor superfamily member 6, Fas, Apo-1 antigen, Apoptosis-mediating surface antigen FAS or FASLG receptor. CD95 is a 310 amino acid ~40-50 kDa single pass type I transmembrane glycoprotein expressed by activated T and B cells, NK cells and thymocytes. Mutations in the CD95 gene, FAS can lead to the development of Autoimmune lymphoproliferative syndrome 1A (ALPS1A), an apoptotic disorder with early onset resulting in an accumulation of autoreactive lymphocytes (Peters et al. 1999). Fusion protein comprising extracellular domain of human Fas linked to human Fc. Mesdaghi, M. et al. (2010) Natural killer cells in allergic rhinitis patients and nonatopic controls. Int Arch Allergy Immunol. 153 (3): 234-8. Ximeri, M. et al. (2010) Effect of lenalidomide therapy on hematopoiesis of patients with myelodysplastic syndrome associated with chromosome 5q deletion. Aref, S. et al. (2004) Accelerated neutrophil apoptosis in neutropenic patients with hepatosplenic schistosomiasis is induced by serum Fas ligand. Hematol J. 5 (5): 434-9. Welsh, J.P. et al. (2004) In vitro effects of interferon-gamma and tumor necrosis factor-alpha on CD34+ bone marrow progenitor cells from aplastic anemia patients and normal donors. Hematol J. 5 (1): 39-46. Wethkamp, N. et al. (2011) Daxx-beta and Daxx-gamma, two novel splice variants of the transcriptional co-repressor Daxx. J Biol Chem. 286 (22): 19576-88. Chen, J.Y. et al. (2003) TNF-alpha renders human peritoneal mesothelial cells sensitive to anti-Fas antibody-induced apoptosis. Nephrol Dial Transplant. 18 (9): 1741-7. Papadaki, H.A. et al. (2002) Bone marrow progenitor cell reserve and function and stromal cell function are defective in rheumatoid arthritis: evidence for a tumor necrosis factor alpha-mediated effect. Mavroudi, I. et al. (2011) The CD40/CD40 ligand interactions exert pleiotropic effects on bone marrow granulopoiesis. J Leukoc Biol. 89 (5): 771-83. Pyrovolaki, K. et al. (2009) Increased expression of CD40 on bone marrow CD34+ hematopoietic progenitor cells in patients with systemic lupus erythematosus: contribution to Fas-mediated apoptosis. Arthritis Rheum. 60 (2): 543-52. Boula, A. et al. (2006) Effect of cA2 anti-tumor necrosis factor-alpha antibody therapy on hematopoiesis of patients with myelodysplastic syndromes. Clin Cancer Res. 12 (10): 3099-108. Papadaki, H.A. et al. (2005) Normal bone marrow hematopoietic stem cell reserves and normal stromal cell function support the use of autologous stem cell transplantation in patients with multiple sclerosis. Bone Marrow Transplant. 36 (12): 1053-63. Bachsais, M. et al. (2016) The Interaction of CD154 with the α5β1 Integrin Inhibits Fas-Induced T Cell Death. PLoS One. 11 (7): e0158987. Paulsen, M. & Janssen, O. (2011) Pro- and anti-apoptotic CD95 signaling in T cells. Cell Commun Signal. 9: 7.